11/27/11: After some sound advice from ladybattousai, I have edited my story, Hakumei Jouin ken Gekkou Tenshi. 12/17/11: I have participated in the Reindeer Games DDN. My story, Reindeer Games is now finished. 3/12/13: After a long hiatus due to RL concerns I have returned to Dokuga. And I am currently doing a Final edit on the first chapter of Hakumei Jouin ken Gekkou Tenshi. It should be posted either later today or tomorrow. 3/16/13: I've finally posted the first chapter of HJkGT. 1/9/14: And so the New Year begins with a new chapter for Hakumei Jouin ken Gekkou Tenshi. 12/20/14: I have participated in the The Proverbial Challenge, 2014. 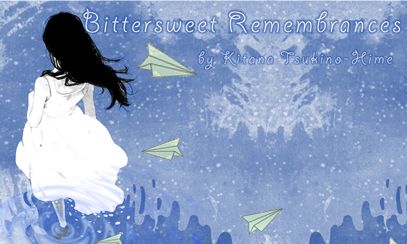 My story, Bittersweet Remembrances is now finished. 12/21/14: I plan to participate in the Proverbial Challenge, 2015 as well. With my story, Time In A Bottle. My goal is to finish all prompts for the coming year. Wish me luck! 12/30/14: I have participated in the Holiday Exchange, 2014. 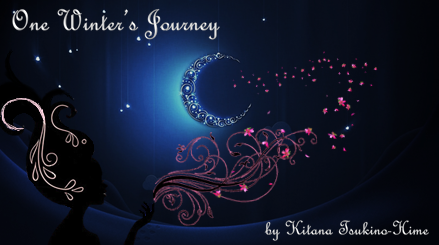 With my story, One Winter's Journey. A gift for the fabulous, Miss Katt. Which is now finished. 1/04/15: For those who enjoyed OWJ, fret not, as a sequel will be in the works as soon as my Muse & plunnies organize themselves! 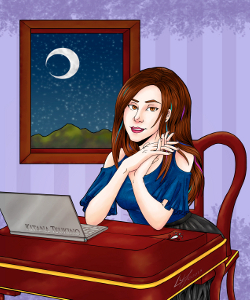 2/6/15: Fabulous Authoress Icon commissioned from and created by the equally fantastic and talented, Lord Maru. Fabulous OWJ & BR Story Banners created by the equally fabulous and talented, Sesshomaru's Secret Admirer. 12/31/15: I have participated in the Holiday Exchange, 2015. With my story, Christmas Kismet. A gift for the fabulous, Sakura Dragon 10. Which is now finished. 1/5/18: I have updated my story, Time In A Bottle. Sesshomaru Taisho is the new Drift King. Winning the title by rights from his father, Touga Taisho. He & his team the Twilight Lords rule the city and streets of Tokyo. But a new challenger and her team the Moonlight Angels have come on the scene. There is more to the Twilight Lords than meets the eye... A team composed of two Inu Youkai, An Ookami Youkai Hiko, an Inu-Hanyou, & a Houshi descendant. Can the Moonlight Angels match these males in power & driving ability? A team composed of a Miko, a Majo, an Ookami Youkai Hime, the Miko's cousin, & a Tyja descendant. I think perhaps they can... Time alone will tell the tale. In this shadowed underground where Yakuza, Youkai, and ningen meet things are bound to clash. And what does Touga Taisho have to do with this...? Loosely inspired by Fast & Furious: Tokyo Drift. [A Dokuga Exclusive...!] Sesshomaru contemplates why Kagome disobeyed him... As she awaits her punishment. Written for GM DDN-3/23/13, May continue into a Two-shot... To you YIMs, Shoo, please. Tis' not for joo. My entry for the Holiday Exchange, 2015. A gift for Sakura Dragon 10! A Miko and Daiyoukai twined together by the past, the future, and a power far beyond them. They drift together on a sea of memories... That led from the early days of a tenuous alliance. To a Mating forged through a deep and abiding love. As the birth of their first-born, his heir looms nigh. A collection of inter-connected drabbles for the Proverbial Challenge, 2014. My entry for the Holiday Exchange, 2014. A gift for Miss Katt! When all hope seems lost, the Lord of the West turns to his last chance to save the one most precious to him. But is it already too late...? Had he waited too long? In the fight for a single gentle soul, will Sesshomaru lose himself to madness? Or gain so much more than even he ever knew possible...? A series of inter-connected drabbles. 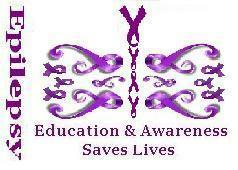 Please read & review. Thanks for your review on Cirque DeYoukai!